As the number of workers who use smartphones, tablets and notebooks on the job skyrockets, it’s no longer sufficient to rely on casual or ad hoc policies for mobile devices. A formal mobile policy is essential to derive the maximum benefit from the use of these devices and to avoid the common oversights and mistakes that can lead to potentially devastating consequences. 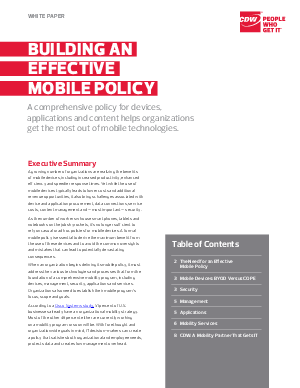 When an organization begins defining its mobile policy, it must address the various technologies and processes that form the foundation of a comprehensive mobility program, including devices, management, security, applications and services. Organizations also need to establish their mobile program’s focus, scope and goals. According to a Cisco Systems study, 51 percent of U.S. businesses already have an organizational mobility strategy. Most of the other 49 percent either are currently working on a mobility program or soon will be. With forethought and organizationwide goals in mind, IT decision-makers can create a policy that satisfies both organizational and employee needs, protects data and creates low management overhead.